The village of Tedburn St Mary seven miles west of Exeter has no obvious centre but, sited beside the school, the Methodist Church certainly feels itself to be at the heart of the community. 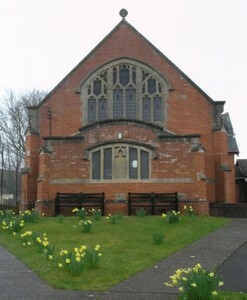 Opened for worship in April 1930, the building was erected as a typical Methodist Church of the day, but with the pews replaced in recent years with chairs and carpet laid, there is an open and welcoming atmosphere which lends itself to different forms of worship, and we aim to have an Alternative Worship service every 6 weeks or so. We have an average congregation of twenty adults, with a regular Junior Church. We hold regular ‘united’ services with our friends at the Parish Church and enjoy a close relationship with the local school. All our activities are for those of faith or none. Our fundraising activities include local and worldwide charities. 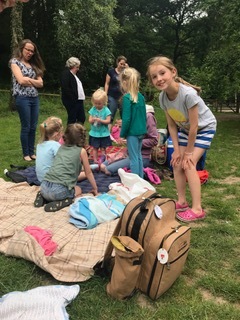 We have been holding a Messy Church on a Friday, but this is taking a Sabbattical, and instead the leadership team have been taking craft and bible stories out into the community, visiting toddler groups in nearby villages. 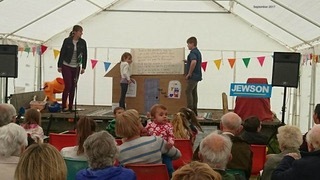 This team also forms the nucleus of a group drawn from the wider village population who are working with Open the Book, to present bible stories in the Tedburn Primary School. 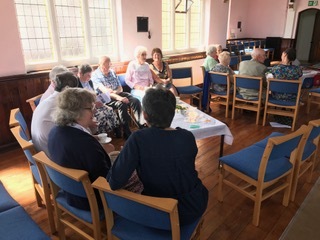 The members of Tedburn Methodist Church are always prepared to raise funds for other causes, offering occasional lunches and coffee mornings. 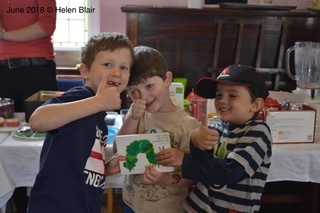 We have some photos of a recent event in aid of Action for Children, where the children were heavily involved. Our plan to establish Tedburn Church Kitchen has been successful. 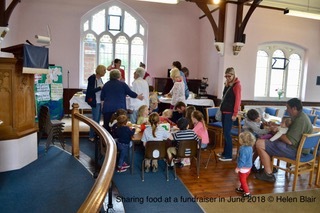 The initiative has established a network of cooks from within the church and the wider community to cook an extra meal or two (from time to time), when they cook their own, so that it can be frozen, and enable us to deliver to individuals and families, who unexpectedly find themselves in times of difficulty – such as bereavement, illness, coping with a seriously sick child, and could do with a meal over a number of days (or weeks) to tide them over their period of trouble. The meals are stored in a freezer at the Methodist Church. Anyone can contact TCK and ask for assistance – for themselves or another – and a member of the group will collect and deliver as many meals as necessary. Our Discipleship Group is also strong, and includes friends from the Parish Church – it has been seen as a blessing to both denominations. We have also received a grant from the Parish Council, in recognition of our work within the community, to allow us to replace our church PA system. Each Saturday morning our schoolroom is open for the Community Library, from 10am until noon.During term time, on the 2nd and 4th Saturdays of the month, the Library is also host to our Crafting Club. This started out as a needlecrafting group, but has expanded to include any craft that people want to learn about, teach about, or just practice! Everyone is welcome, there is a £1 per family subscription which covers the cost of our tea, coffee and biscuits and we enjoy a happy, informal couple of hours with friends from the village. 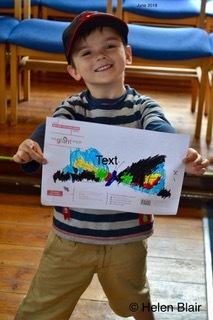 Children are all welcome, and are provided with crafts if they don’t come with something of their own to do…. Please join us. Tedburn village has a Summer Fair in September, and the Sunday of that weekend sees both the churches at the marquee running a morning and an evening gathering, for the benefit of those who do not normally attend church. Being an agricultural community harvest time has always been an important part of the church calendar. We have taken harvest out into the community and updated the celebration, by holding a barn dance. Funded by the two churches, entry is free to all, but donations to Christians Against Poverty have been welcomed. 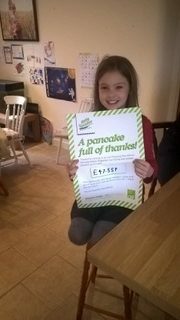 This is Josie, aged 8 and member of our Junior Church, who was inspired to plan a Flipping Marvellous Pancake Party to raise money for Christians Against Poverty on Shrove Tuesday. With the help of a local mum and her crepe maker, we served over 40 pancakes in an hour and raised £47.55 for CAP. We are super proud of Josie and very grateful to our village community for supporting the event!